We are basking in glorious autumn sunshine in Buckingham today! I love this time of the year when it's warm enough to wander about outside without a coat but there is a slight sharpness in the air. I'm lucky enough to work in a room with French doors which open onto my garden; but there is another window in the room which looks out onto a huge, old oak tree. That's what inspired the autumnal birthday card I'm showing you today. Cut a piece of Very Vanilla card stock 7cm wide x 7.5cm high. Colour the oak tree stamp with markers and stamp onto the card stock. Pierce a frame around the edge of the panel. Cut a piece of Old Olive designer paper 9cm wide x 11.5cm high. Cut a contrasting piece 9cm wide x 5cm high and trim two 1/2 cm strips off the 5cm height. Attach the larger piece to the Old Olive dp and add the strips to the top and bottom, leaving a slight gap. 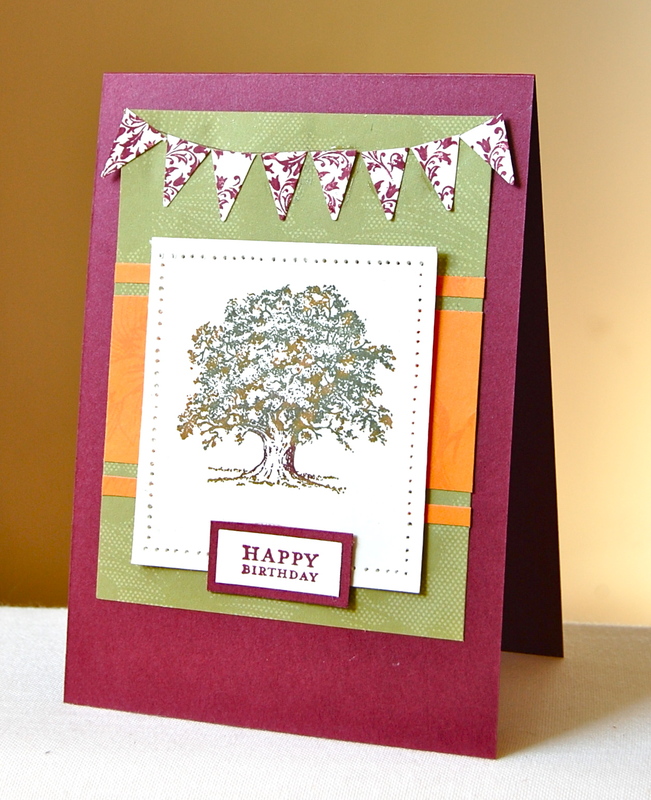 Adhere the designer paper panel to a Bravo Burgundy card blank and add the tree panel on top. Make bunting by stamping some scrap Very Vanilla card stock with the foliage image from Tiny Tags. Cut out with the star punch and snip the triangles off the star (thanks for that tip Monica!) Draw a line across the top of the Old Olive dp with the thin end of a Chocolate Chip marker. Glue the bunting to the line. Stamp a sentiment onto a piece of Very Vanilla card stock. Cut out and mount on a slightly larger piece of Bravo Burgundy. (TIP: I used the bottom of my tag punches which takes the guess work out of cutting and gives a neat look.) Attach the sentiment to the card front. By the way, it's worth mentioning that the Sweet Pea designer paper stack from the mini catalogue is on the Last Chance List. It used to be £19.50 for 48 sheets of quality double-sided designer paper - and I thought that was a bargain! The price has now been slashed to £9.75 - that's 20p per 12"x12" sheet! It's almost rude not to!!! Check the Last Chance List here - and hurry to avoid disappointment as items are selling out on a daily basis now. Click here to send me an email when you're ready to order and I'll get straight onto it for you. There'll be more crafting fun here tomorrow. Do come back and join me! That oak tree is one of my favorite images. I like how you colored it. The banner is fun too. In the US we've had the new colors for a couple of months now. I really like the poppy parade and pear pizzaz best with the early espresso and cherry cobbler coming in a close second. I can't wait to see what you do with them once you are allowed to show them off. I really need inspiration for all the other new colors I bought but haven't used yet. This is beautiful, Vicky! I love the rich autumn colours and that banner above the tree image is very elegant. Stunning card, love the little flags with that gorgeous tree! Beautiful card Vicky. Aren`t you lucky having an oak tree to look at. I`m very envious lol.